TotalTester CompTIA CySA+ Practice Tests are now available via our training hub as an online product (not yet optimized for mobile devices, but this is coming). TotalTester CompTIA CySA+ practice tests online product works on your browser (we recommend and support the current and previous major versions of Chrome, Edge, Firefox, and Safari). 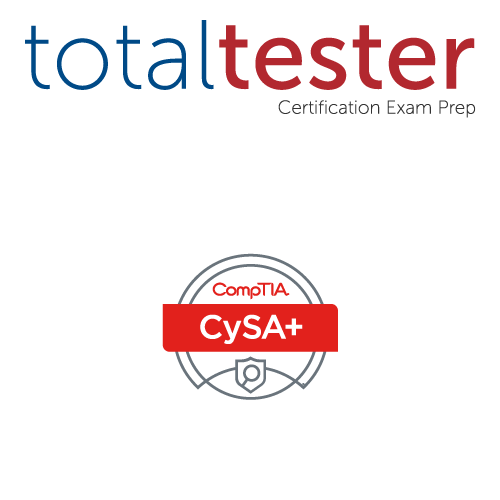 The Total Tester Online CompTIA CySA+ Practice Tests (CS0-001) look and act like the CompTIA CySA+ exam experience and lets you test your technical knowledge on key exam objectives. Questions drawn from a pool of over 150 questions. Full coverage of the CS0-001 exam.